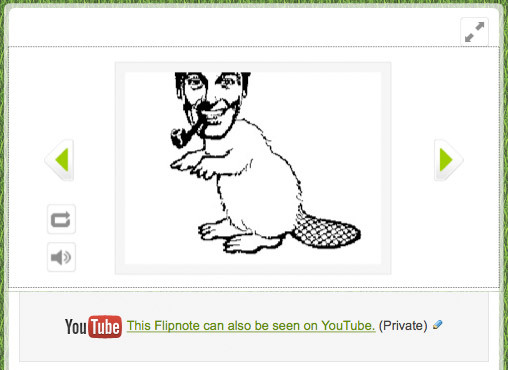 Today we added a new feature that allows you to upload Flipnotes you have posted on Flipnote Hatena to YouTube. Both a Hatena ID and a Google account are required in order to use this feature. 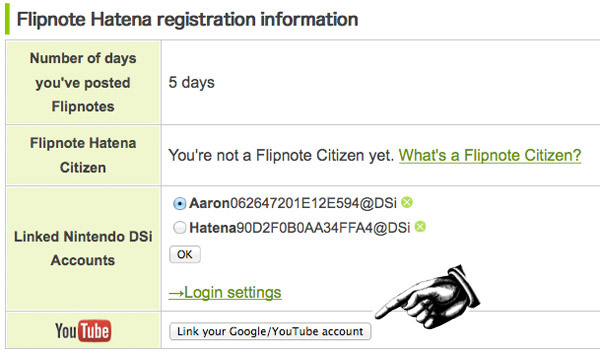 In order to upload your Flipnotes to YouTube, you will first need to link your Hatena ID with your Google account. If you do not have a Google account, you can create one to use this feature. 5) Proceed with the authentication process. You will be transferred to Google's site in order to complete authentication. 6) After you have linked your Hatena ID and your Google account, your screen should look like the one below. 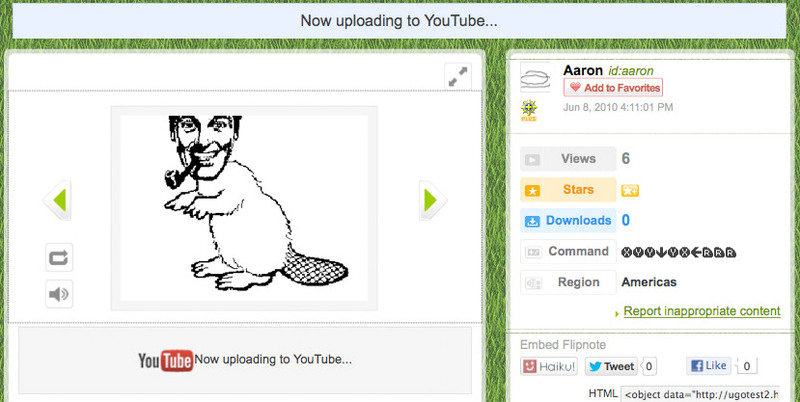 You can upload to YouTube from the pages of Flipnotes you have posted to Flipnote Hatena. 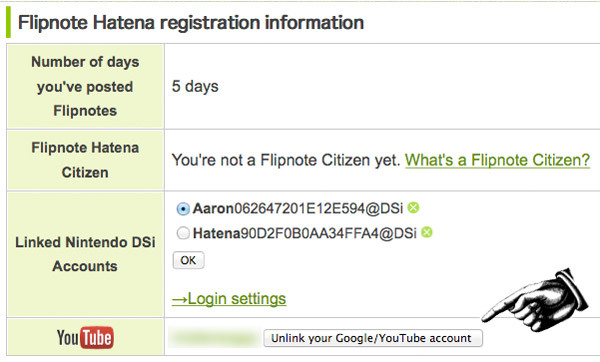 Please note that you can only upload Flipotes to YouTube that were posted from your Hatena account. If you have never uploaded a video to YouTube before, you will first need to create your own YouTube channel before you can upload videos. Please access the URL below to create your YouTube channel. Access the page of the Flipnote that you wish to upload, and click the "Upload to YouTube" button. 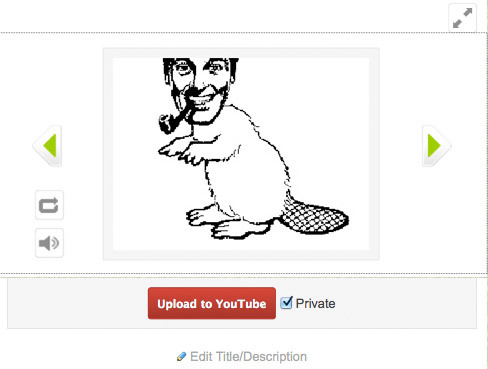 Enable the check box to upload your Flipnote to YouTube as a private video. You can change the privacy settings for the video on YouTube after the upload is complete. If you do not enable the check box, your video will be uploaded as a public video. Below is how your screen will look while uploading a Flipnote to YouTube. It may take some time for your uploads to YouTube to complete. Below is how your screen will look after your upload to YouTube is complete. Please remember that you should only upload content to YouTube that does not violate the YouTube Community Guidelines and the YouTube Terms of Service. All content that you post to YouTube is your own responsibility, and Hatena is not able to manage nor remove any content that you have posted to YouTube. We hope that this new feature adds to your continued enjoyment of Hatena's online services.